There are currently 88,727 users on this website. While the die design of the official circulating coins was subject to very strict rules, the design of tokens (jetons, rechenpfennige, rekenpenningen) enjoyed more freedom. Which leads automatically to the following question: what inspired the mint master and die engraver for a new piece? Numerous examples point to political situations, biblical scenes, epical stories, epical heroes. 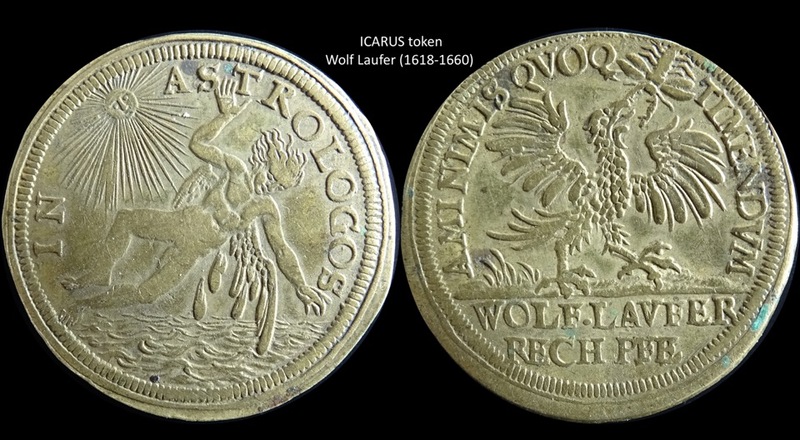 This summer I picked up a striking rechenpfennig from the great 17th century Nürnberg mint master Wolf Laufer II. The brass piece has no date, weighs 4,63 g has a diameter of 26 mm. The obverse shows the well known classical story of Icarus, the man who wanted to fly free as bird. 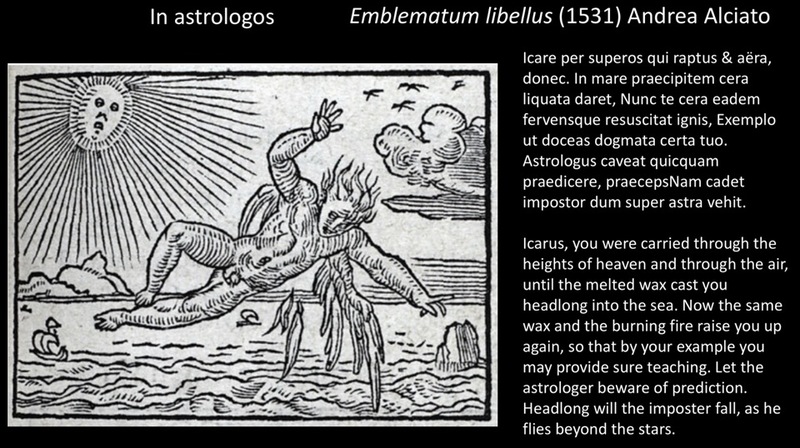 The image is the moment Icarus crashes into the sea, because he went too high in the sky so that the heat of the sun melted away the wax that glued the big wings to Icarus back. It is a story about hubris, too high ambition and human modesty. But I found the Legend: IN ASTROLOGOS enigmatic. Astrologus caveat quicquam praedicere. Praeceps nam cadet impostor dum super astra volat. Let the astrologer beware of prediction. Headlong will the imposter fall, as he flies beyond the stars. This fits well into one of the most profound cultural changes in Western civilization humanism, opposed to medieval occultism and superstition. From this start it was not too difficult to find the source of the reverse A MINIMIS QVOQ TIMENDVM. 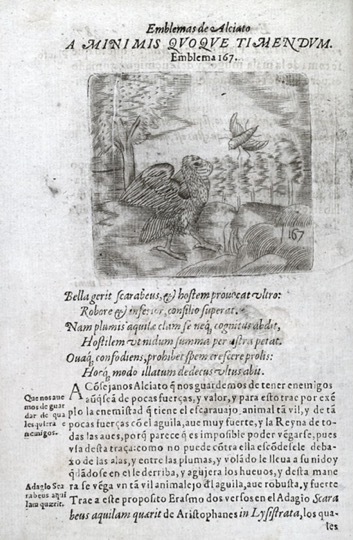 The same 1531 emblem book tells the story of the powerful big eagle and the small beatle, who wins the battle by infestation of the eggs in the eagles nest. 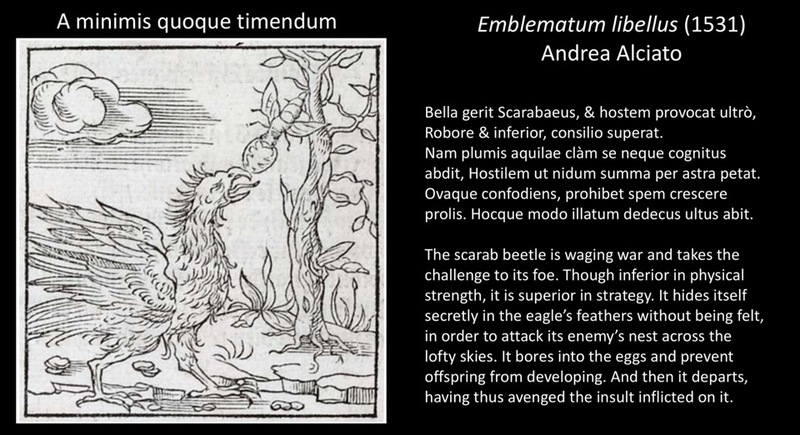 The source of the story is the classic poet Aesop, Fables 4 "feud between the eagle and the beetle", rediscovered by the Dutch humanist Erasmus of Rotterdam, Adagia 2601, Scarabaeus aquilam quaerit (first published in 1500). May be you have in your collection a token, medal or coin in which the die design could connect to the images and idea's of other emblem books. Or paintings, statues, engravings known to the mint master at his time. It would be wonderful if you post such items in this thread and fun to learn from the ideas of CCF members. I take this opportunity to wish all CCF members a happy and healthy 2019 ! That moments of joy during the wonderful coin/medal/token collecting hobby may provide you with the ingredients of happiness. Fascinating information. Thank you for sharing! scopru, Spence, DBM, jbuck: thanks for your comments ! 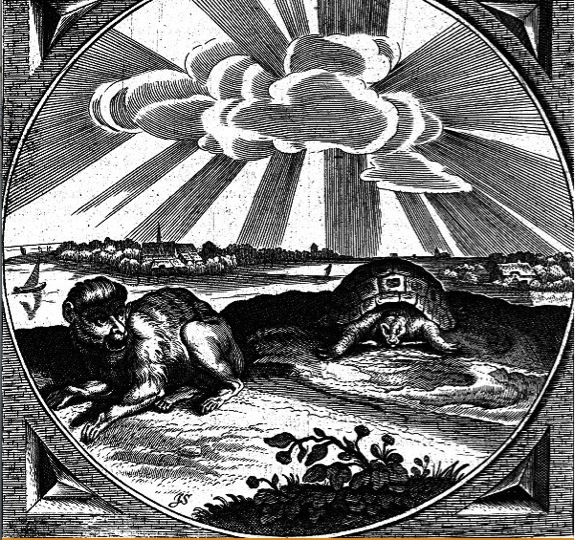 the image on the obverse and the legend DISSIDET QUOD IMPAR EST (keep apart what is different) is linked to the Emblem Book of the Dutch poet Jacob Cats - Sinne- en minnebeelden published in 1627, a few years before the jeton was minted. Fascinating piece of research, 1c5d! I showed your post to my spouse, who is retired from the library science field, and she commented that Glasgow University Library is famous (in her field) for their collection of these emblem books, and also seals from medieval & Renaissance times. I was struggling to imagine how an engraver in Nuremberg would be exposed to the work of an Italian who was working in France. Then I saw that the emblem book in your link was published in Augsburg in 1531. For this we can thank the invention of the printing press, and the explosion of this technology across Europe in the 16th century, or perhaps Laufer's access to the images would have been impossible. Before the printing press, books were painstakingly copied by hand, very expensive, and generally only accessible to the aristocracy or clerics. 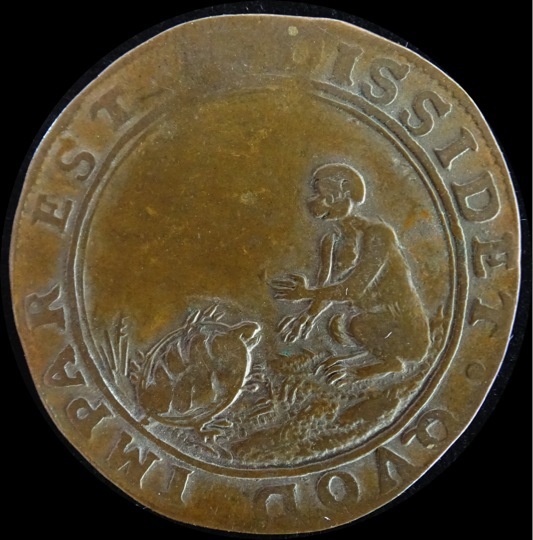 I do not have such a good example as yours, where at least the obverse imagery of the token is copied quite precisely from the Alciato emblem. However, as you know, I have a collection with representations of saints on coins, and these representations are generally fashioned off of more generic imagery (iconography) of the period in paintings or statues. I will see what I can post that might be of interest. The most widely produced book from early medieval times in Western Europe is believed to be the Book of Hours, a devotional book (typically the size of a mdern paperback) containing biblical verses and prayers. These were handmade manuscripts, produced on commission, usually for members of the aristocracy. A Book of Hours intended for a woman would include the Hours of the Virgin, a cycle of prayers related to Mary. Versions that were "illuminated" would contain artwork in addition to the text. Similarities in the scenes are evident (the lily was a symbol of purity or chastity). I don't know if Charles used an Italian artisan as mintmaster, or brought someone from France. 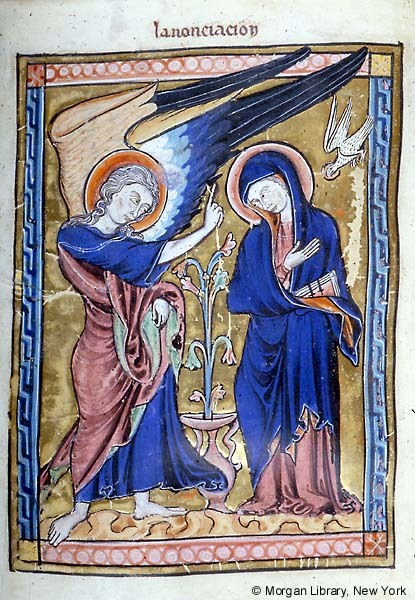 Certainly this representation of the Annunciation is well established in Northern European art by the mid-1200s. I've been less able to find an example from Italy this early. The saluto d'argento is a real coin, so perhaps it is a good idea to move this thread to the General Numismatic Discussion Forums / Main Coin Forum ? I do not have any tokens that I will be able to discuss in this theme, but have more coins, so that sounds like a smart idea. and you are extremely fast, jbuck !